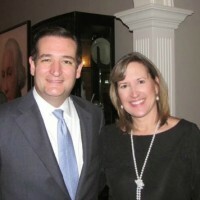 (Austin, TX) Monday, Konni Burton endorsed Senator Ted Cruz in his presidential bid. The endorsement came on the heels of Senator Cruz’s formal announcement of his candidacy at Liberty University in Lynchburg, VA.
“I’m all in for Ted Cruz. I have known Ted since he was polling at 3% in his bid for U.S. Senate. He is one of the handful of elected officials who has done what he said he would do. His honesty and commitment to principles drive the establishment crazy, but it’s what the people want and deserve. We need the next generation of conservative leaders to stand up and take our country back. I’m proud to stand with Ted Cruz in his effort to be our nation’s next President. Konni Burton represents District 10 in the Texas Senate. Her district includes portions of Tarrant County including the cities of Ft. Worth, Colleyville, Arlington, Bedford, Euless, Hurst, Southlake, Burleson, Mansfield, Kennedale, Crowley, Aledo and Forest Hill.